a book chick: "Sense and Sensibility"
my take: I really can't help myself: this series of current authors re-writing the Austen novels is so juicy I must pluck them from book stores. Here is the first fruit. I first read Sense & Sensibility in my late teens/early 20's and I admit that most of my recent experience with the novel is via the Emma Thompson movie version. Which I love and adore. And Ms. Thompson. Love. Adore. The three sisters, their mother, their creepy/wimpy half-brother, the wicked sister-in-law, the simpering Lucy, the boisterous bunch at Barton Park, the dashing young men - they're all here. Plus a bunch of children. So nice to have the gang all together and outfitted with all the modern amenities. Some of it seemed a bit forced ... to make family estates seem the norm takes channeling a bit of Downton Abbey and melding it with a British elite/nearly royalty mentality. Cell phones, automobiles, jobs, school, are not things Jane had to bother with, and somehow Ms. Trollope managed to finagle in that which Jane did have to worry: inheritance laws. It's not as great as the original, but that's not to say it's bad. 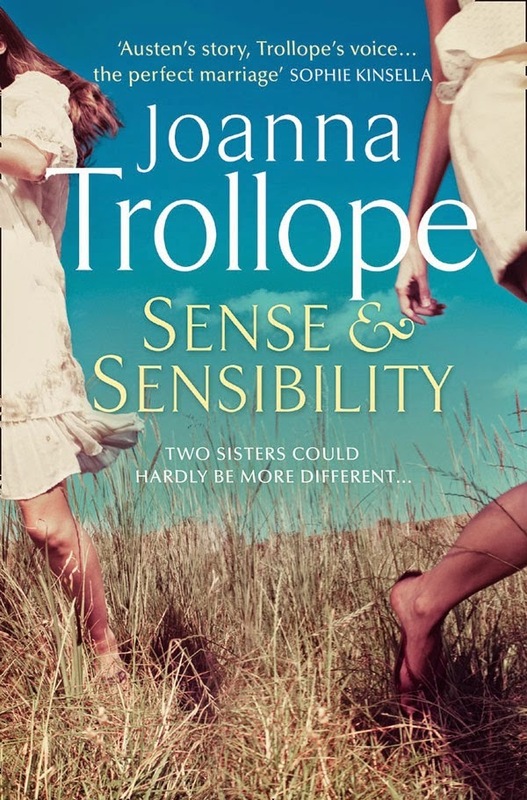 Ms. Trollope did a very close copy of the storyline and I'll be interested to see if the other books in the re-make series are so closely followed. I Capture the Castle (based on P&P) and Clueless (movie based on Emma) seem to convey the spirit of the original rather than re-write in modern language/ideas/circumstances in a way that is a little less clunky or forced. I knew how it was going to end and I couldn't put it down. So there's that. Sounds like a lot of Jane Austen spinoff things... not all that well done ("forced" was definitely what I thought of Death Comes to Pemberly), but a girl can't help herself. Curious about some of the others of these current author versions - kind of an interesting idea that they're getting a variety of authors to do them, which may mean some are great and some are so so. The only Austen book I've read so far is Pride & Prejudice which I absolutely love. I've been slowly buying the other ones with the intention of reading them all. I didn't know they were doing remakes of them, might be fun to do read them consecutively.